Aarti Khosla stands in her Westport shop, Le Rouge Chocolates by Aarti, on Feb. 1. WESTPORT — A downtown chocolatier hopes to build a “wall of love” this Valentine’s Day through sales of chocolate hearts. 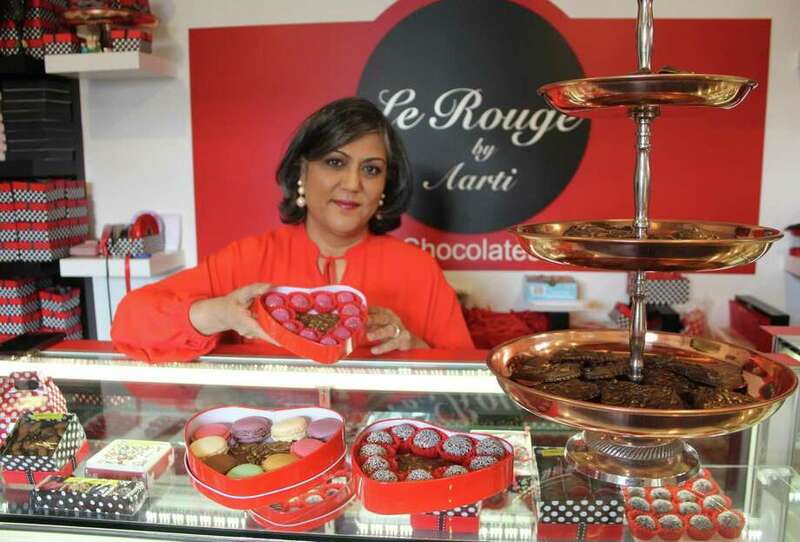 The idea came to Aarti Khosla, owner of Le Rouge Artisanal Chocolates on Main Street, a week before Valentine’s Day in 2017, during the first bout of discussions over President Donald Trump’s proposed border wall. “All that was happening around us was a lot of angst and people being anxious, and hatred, openly. I figured, why not build a wall of love?” Khosla, 53, said. As a rule, Khosla had never made chocolate hearts. “I don’t believe in hearts. They’re too symbolic. You don’t have to give somebody a heart to say you love them,” Khosla said. Nonetheless, Khosla bought a heart mold and began selling large, dark chocolate hearts at her store. “I said buy them and give it to somebody random and put a smile on their face. Let them know you care,” Khosla said. Now going on two years, Khosla’s “Give a Little Love” campaign donates 10 percent of the sales from any heart shaped product at Le Rouge to “She’s the First,” a New York City based nonprofit that fights gender inequality through education across the globe. Despite the linguistical similarities between her campaign and the border wall that has been a fixture of Trump’s administration and the recent government shutdown, Khosla insists she doesn’t take a political stance with her shop. The hearts projects is rather meant to unite people in spite of political polarization, Khosla said. “Love is the universal language of the world,” Khosla said. The mission at the heart of Khosla’s campaign is similar to the goals she had for Le Rouge when the shop opened in 2014. After decades in the corporate world and time spent oversees for her and her husband’s jobs, Khosla said she was ready for a change when her family returned to Weston in 2012 following two years in Hong Kong. “I’ve always worked full-time, and suddenly I was finding that I didn’t want to do the rat race. I didn’t want to get on a plane. I didn’t want to come back late from meetings, and I wanted to be with the kids,” Khosla said. An energetic person by nature, however, Khosla decided to keep herself busy by making chocolates that she sold at the Westport Farmers’ Market. “When I started this, it was for my sanity,” she said. Growing up in India, Khosla loved the orange-infused chocolates her father brought home from business trips in Europe. Throughout her travels, Khosla always sought the best chocolatiers and especially loved the mendiant chocolates of Paris, her favorite city. Khosla showcases an array of flavors from around the globe in her chocolates because, she said, international tastes are not often represented in chocolates sold in the region. Among the varieties found in her shop are chocolates inspired by the flavors of Dutch apple pie, China’s Sichuan pepper, Indian pistachio, and Mexican guava chili. Despite the care Khosla puts into her chocolates, she said the greatest joy of her job is in the connections she forms with customer and the community space her shop creates. “For me it’s not just about the chocolates. Yes, it should taste good, it should look good but it’s more to do with spreading love,” Khosla said.